Free Window breaker End Cap for any of these batons. This is a small baton, only 6.375 inches long when in the closed position and only 7/8 of an inch in diameter. It extends to almost 16 inches. The body of the baton is a steel coil spring that will multiply the force of your swing. The steel handle is knurled to enhance grip. Black color. Comes with free nylon belt holster. The 21 inch baton is only 8.5 inches when closed for carrying. 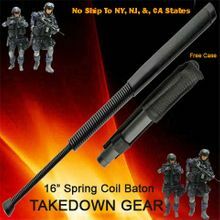 No shipping these batons to NY, CA, MA or outside the USA.